Although tidal and current energy technologies are still being developed and refined, there are already a few in operation. The following are some of the current installations around the world. The SeaGen Project began in April 2008 when a 1.2 MW tidal energy convertor was installed in Strangford Lough. 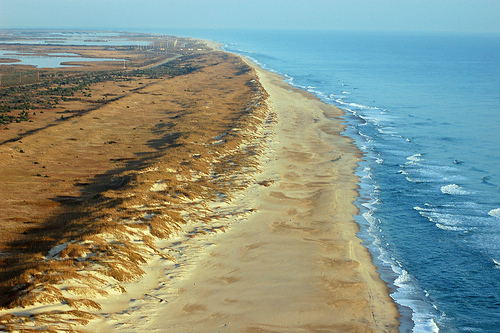 The expected duration of the Sea Generation Ltd project is five years. The turbine generates 3800MW hours per year to power approximately 1140 houses. What is unique about the turbine is that it has a lift mechanism in which it can rise out of the water in order for maintenance. Royal Haskoning Ltd is investigating the environmental impacts of the turbine. So far there has not been any significant evidence of negative impacts. These results are partially because little is known about the studies organisms such as seals. Kvalsund, Northern-Norway is home to a .3MW Hammerfest Strom-turbine prototype. 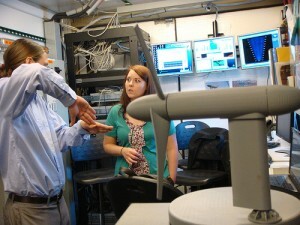 It was installed in 2003 as a test for a future 1MW device to that is scheduled to be installed in Scotland in 2011. Although the turbine is only 0.3MW it is significant because it was the first in the world to convert the kinetic energy of tides into electricity. Akvaplan NIVA, aquaculture and environmental research and consultancy, is studying the environmental impacts of the prototype turbine in Kvalsund. The study is on going but there has minimal effects on the environment, outdoor life and fishing. The company has received support from both UK and Norwegian authorities, as well as received the VIBES award for the international cooperation with the UK utility Scottish Power Renewables. The UK’s Carbon Trust invested over 5.6 million dollars in to Hammerfest Strom. In order to prepare for commercialization, Hammerfest Strom is raising over 17 million dollars. Potential investors include industrial entities, utilities and venture funds. Currently, the study is focusing on the possible effects of the turbines on sea birds and mammals. Hammerfest Strom continues to investigate this renewable energy source and has plans to develop a turbine system that will be able to go commercial in 2012. Other plans include creating many new jobs in Scotland, and working to install a turbine system in Great Britain. The East River in New York City is the first and only functioning tidal turbine system in the United States. A small power company, Verdant Power, began their Roosevelt Island Tidal Energy (RITE) project in 2002. They have finally landed on an aluminum turbine design with a 5m diameter rotor. Currently six full-scale turbines are successfully demonstrating that the Free Flow System can be a viable source of energy. 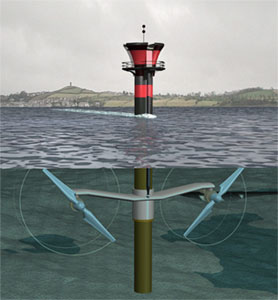 The project demonstration system is the world’s first tidal turbine system that is connected to the electricity grid. It delivers 70MW hours of energy to two households and has 9,000 turbine-hours of operation. RITE is monitoring the operation of the turbine field via fixed underwater hydroacoustic sensors in order to determine its effects on the environment. RITE also characterized and analyzed the benthic habitat of the river. According to these observations, there has not been any significant evidence of increased fish mortality or injury. These observations have not indicated any irregular bird activity in the project area. However, they do suggest that fish tend to avoid the turbine field and instead populate the inshore area. Verdant Power is now awaiting the approval from the Federal Energy Regulatory Commission of the pilot license in order to begin expansion into a 1MW, 30-turbine Free Flow System. If all goes as planned they also aim to expand in order to obtain additional two to four megawatts of capacity. We believe there is a potential for coastal North Carolina to harness some of the Gulf Stream’s energy for electricity generation. Click here to read more!